Jess Uy | Personal Finance & Global Investing: Top 15 Global Equity Funds 2014 | Where Does the Philippines Stack Up in the Global Investment Scene? Top 15 Global Equity Funds 2014 | Where Does the Philippines Stack Up in the Global Investment Scene? The Philippines has always been in the headlines in the local media in recent years because it is doing well - several credit ratings upgrade, above average GDP numbers, young working population, infrastructure developments, and many more reasons to invest in our beloved country. However, is investing in the Philippines the only surefire way of achieving your life goals? Not necessarily. Are we taking too much risk beyond our risk tolerance just to chase performance? Possibly. Are we foregoing the opportunity to tap into global growth as well as growth in other emerging markets by just concentrating on one country? Likely so. The answer to these questions may vary for different individuals but contrary to popular belief with the people I met in the Philippines that global investment is risky; it is actually the other way around especially if you have a properly diversified global portfolio. 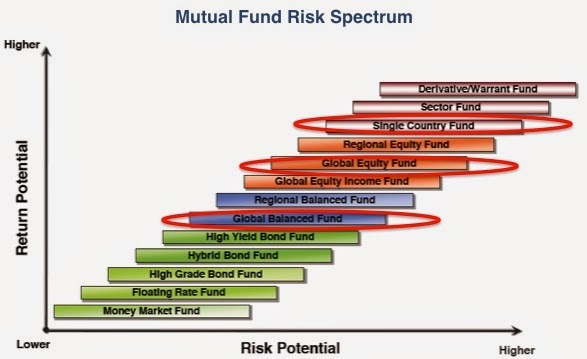 Single country funds are riskier than diversified global funds (See illustration below). With a wide range of choices, you are able to pick and choose markets and instruments that can give you more return with higher risk, or lower return with lower risk, thus allowing you to customize your investment portfolio towards something that is closer to your risk appetite. Moreover, global investing does not mean you do not invest in the Philippines at all; in fact there are several investment vehicles you can use that will allow you to take advantage of Philippine growth even if you are not using local managers. Philippine exposure can be achieved through globally diversified pooled funds, regional funds or even single country funds such as foreign managed Philippine funds. I usually only include the top 10 global funds although I cannot help but modify my list to expand to the top 15 just for this article primarily because the Philippines is making a comeback in the 1st half of 2014. The 1st half 2014 results are dominated by Indian Equity Funds (6 of 15), followed by the Gold Equity Funds (5 of 15), the T.I.P. 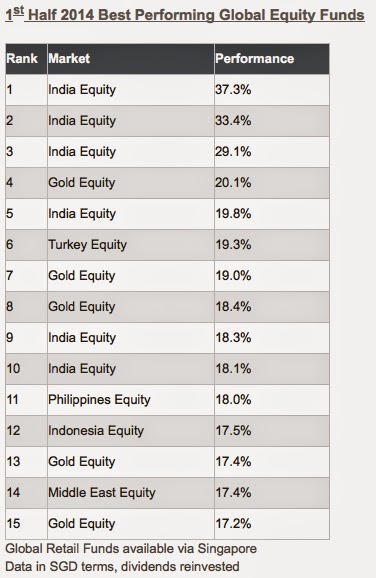 countries (Turkey, Indonesia and Philippines) each had one entry while the 2nd place for 2013, Middle East Equity Fund was able to still hold on to enough gains to be included in the top 15. Specific to the Philippines, after a dismal 2013 with a +1.30% performance of the Philippine index, it has bounced back in the 1H2014 by showing up with 16.21% return at the halfway point of the year. It just missed the top 10 best performing equity funds as it was ranked #11 with an 18.0% performance. 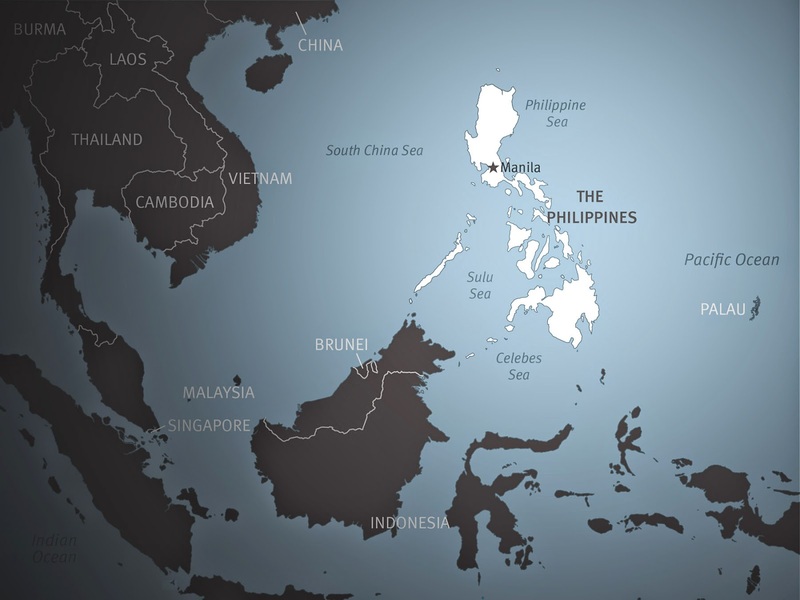 The Philippine fund is managed by a foreign manager (based in Singapore) and available for investors around the world including Filipinos from the Philippines. At the midway point last year, it was the US that was leading the pack with a 35.5% performance and ending the year with 70.6% performance easily beating the US index which only made +29.60% / +33.90% in USD and SGD terms respectively. Lesson here? A reminder that winners rotate. Last year, the US had the strongest performance. This year, India is in the lead. It pays to diversify internationally and take advantage of global markets that are doing well at specific times. *Modi’s victory in India – Modi (15th Prime Minister of India) was sworn in. Let’s see how the different countries will fare in the 2nd half of 2014. 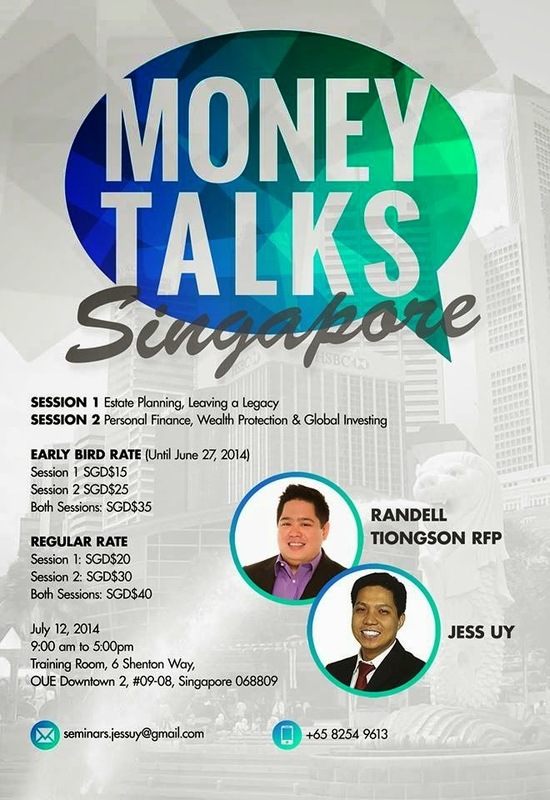 To find out more about the whys and hows of investing in global funds, catch Randell and I in the upcoming July 12, 2014 seminar in Singapore on Personal Finance, Global Investing, Wealth Protection and Estate Planning. More details below.